Choose a page number to visit the recommended websites. Watch marine archaeologists explore a wreck of an ancient Greek ship. See marine archaeologists explore an ancient shipwreck off the coast of Turkey. Find out how archaeologists solve mysteries from the past. See how scientists used technology to reconstruct an Egyptian woman's face. This encyclopaedia traces the extraordinary history of the Ancient World, from the first farmers, and the early civilizations of Mesopotamia, Egypt, Greece and Rome to the eventual decline and fall of the Roman Empire. 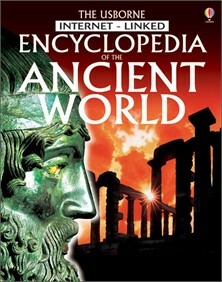 It covers all aspects of life in the Ancient World - from building the pyramids to a day at the Roman Games. There are photographs of glowing treasures in gold, silver and precious stones, 3000-year-old wall paintings with vivid colours, and blackened, shrivelled mummies, combined with reconstructions and cutaways of architecture, to recreate the atmosphere of the time. Internet links are given to a selection of recommended websites, containing additional information for school projects and homework. Many of the websites include sound, animation or video clips, which bring the subject to life.